Cachopo it's the biggest parish with 197,56Km2 and it's situated to the North of the city. It's a very traditional village with about 1000 permanent residents, it remains still very attached to it's origins and the touristic resources are not around the corner. The parish has a strong mountain identity that is expressed in the various traditions and annual festivities like weaving and basketry and wooden handicrafts, gastronomy, knitted garments, and woven blankets decorated with embroidery inspired by the wild flowers found in the fields. Probably one of the most important traditions in Cachopo -- besides the production of honey, wool and cheese -- it's the production of cork which is taken from the Cork Oak. Cork Oaks are harvested every nine years, once they reach maturity. Over the time the tree forms a thick corky bark which can develop to a considerable thickness. During a harvest, the outer bark of a cork oak's trunk and major branches is carefully stripped by hand -- no mechanical stripping devices are allowed. The harvesting of cork doesn't harm the tree, and a new cork bark layer regrows, making it a renewable resource. For those visiting Cachopo, you can do hiking, visit the Museum Centre of Cachopo, and watch the rich archaeological, natural and cultural heritage and enjoy a good meal in the restaurants. 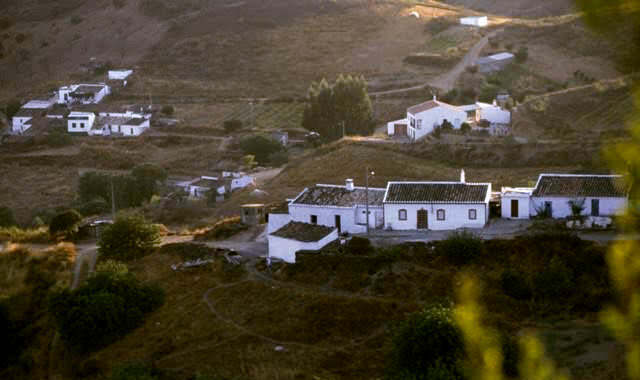 In addition to the landscape and cultural wealth, Cachopo is also rich in historical and archaeological heritage. In the village center, visit the church Santo Estevão (St. Stephen), place of pilgrimage dating from 1535, which was restored in August 2007. Try to visit Azinhosa, Graínho, Casas Baixas and Alcarias de Baixo. In some of these hills you'll discover the mountain architecture: schist or whitewashed houses, community ovens, threshing floors, furnaces and decorated chimneys. Here you will also find the Windmills, once used for the processing of cereals from wind energy. Currently, these spaces are in ruins or converted into houses. Crossing Vale João Farto and Navalha, you will find edifications commonly known as haystacks. These constructions, mad of stone and thatched roofs or rush collected from the stream, are of prehistoric origin, and were used for the storage of feed. Near Mealha lies the necropolis, the Anta das Pedras Altas (funerary monument of the Neolithic). In Alcaria Pedro Guerreiro you can see Anta da Masmorra (dolmen of the dungeon). Towards São Brás de Alportel you will find the Fonte Férrea (Iron Fountain), whose name derives from the quality of its waters rich in iron, surrounded by an imposing vegetation. Head towards the site of Feiteira. Enjoy your stay and go through the Natural Viewpoint Cerro Malhanito (479 meters high), from which you can enjoy a magnificent view of the mountains and the barrocal.